Testing Trisha ~ Single parenting at its finest: Aloha/Fun Follow/Feed Me "Friday" - Shop: Online or Store? Aloha/Fun Follow/Feed Me "Friday" - Shop: Online or Store? Do you prefer to shop online or in the store? A: Although I hate paying for shipping, I would rather shop online. So much easier to "shop around" for the best price online, no wasting gas driving all over town. I like to do a little of both. This year I am trying to pay cash for everything so been doing more in the stores. Depends, but I prefer stores. I enjoy both. It really depends on the deal. I like the concept of shopping online, but for some items I like to at least see them in person. Guess it is a mix for me. It really depends on what I am looking for. If it is something that I need to see and feel or try on then store. If it is something I can get a better deal on by shopping online and don't need to do any of those things and can tell just by looking at a product description then online. i like sopping online - convenient, and less stressful, but i am always disappointed when my purchase arrives. I prefer in store when I can feel and touch and see the size of the product I'm purchasing. I do agree that shopping online has its advantages too. normally I'd say in store but with the crazy Christmas crowds this time of year, online is definitely nice. It depends on what I'm buying. I prefer to shop for clothes and shoes in a store. Hopping over your way to return the follow! Thanks so much for joining FMF, grabbing the blog hop buttons and our buttons! We really appreciate it! I am following you on gfc and subscribe to your email. Hope you link up again next week! Following you back from my Channeling Ricky site. I tried to leave a comment on your novel blog but advertisement below the comment would not let me post. Anyway, interested in participating in the book blog in the future. I will check back when I see new posts on my dashboard. Thanks for stopping by my blog and for following! I'm following you back! Have a great weekend! I prefer shopping online and having it delivered. Although I do enjoy the small stores. I am so with you, I so hate going shopping normally, but this time of year - forget it! I usually shop online and try to find places that offer free shipping like Amazon.com. Hi. 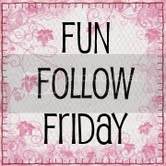 I’m following you back from the Fun Follow Friday. Thanks for stopping by http://justanotherhat.blogspot.com/. It is not the shopping online that makes me hesitate, it is the returning hassle if I am not happy. I prefer the hands on, try it out before I buy method, and if I have to return or exchange anything I don't want to have to package it pretty. Thanks for stopping by, I followed you on GFC. Liked on your blog Facebook and Followed your twitter, hope you can come back to Blogger Broadcast and return the love. Have a great weekend. I can't find your GFC,, am I blind?! ?